Adds just over 140 lines of dialogue to help flesh out Haley's character and show an increased focus on her decreasing selfishness and expanding interest in photojournalism. Includes rainy day dialogue as well as festival dialogue changes! Haley Dialogue Expansion requires the most recent version of the beta release for Content Patcher, please be sure to update! 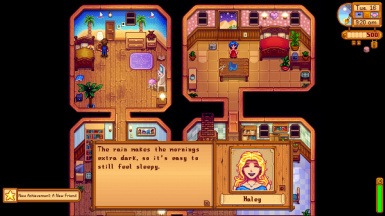 1.2 now includes rainy day dialogue as well as festival dialogue! This mod was written for the 1.3 beta. Haley only has four 10-Heart dialogue phrases. Four. Now she has 28, as well as 28 for every other heart level, too. Adds new dialogue for rainy days for each heart level, as well as updated festival dialogue for 4, 8, and 10 hearts! 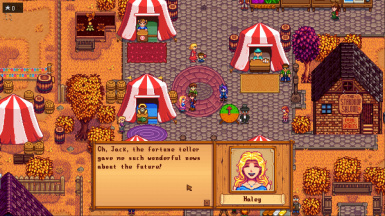 Although it's not currently possible to update rainy dialogue or festival dialogue based on heart level, I've fudged around this by making the dialogue update after you've viewed Haley's heart events. Since festivals happen much less commonly than rainy days, festival dialogue has been updated to change after the 4, 8, and 10 heart events, including the Night Market! Have you befriended or romanced Haley in the past, and found some modicum of appreciation for her character development, but found it lacking nevertheless? I gotchu. 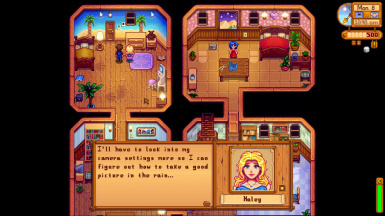 Although Haley remains relatively aloof until she hits 4 hearts, once she starts to open up to the farmer, she'll become more talkative about her interest in photography, her place in the community, and her ever-bettering relationship with her sister. She decides to donate all of her extra clothing, talks about meeting her neighbors and finding appreciation for them, and even apologizes for her initial behavior. 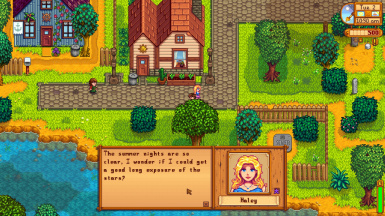 If you spend any time at all focusing on Haley, you're not likely to see her 2-Heart dialogues from later in the year, but they are there should you ignore her on another playthrough. 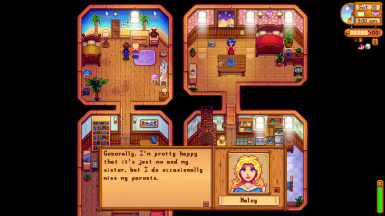 Focusing totally on Haley will cause you miss some of the various dialogue if she befriends the farmer "too quickly," so you can always find some of that dialogue to be a new experience on another playthrough. If you like it, please endorse! If you don't, please let me know what I could've done differently! Feedback is encouraged and happily accepted! I totally didn't read most of the stuff I wrote again, so there may be spelling mistakes--if you find anything, please let me know! 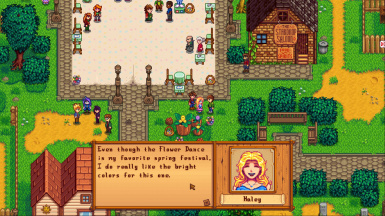 When it comes to writing for Stardew characters, I strive to keep the vanilla feel and lore-adherence as much as possible, while providing enough variety to keep characters interesting in all interactions by minimizing repeated phrases and by building their openness to the farmer across heart levels. NPCs should feel characterization-appropriate social distance at lower levels, and datable NPCs should be flirtier at 8 and 10 hearts, but not straying from their narrative. I always seek to expand on each NPC's place in Pelican Town, among their friends and family, and within the generally light-hearted-but-sometimes-deeply-serious tone of the game as a whole.